If you cannot teach someone with no more than a napkin and a pen, or less, you should not teach. The nature of napkin ed requires one to one teaching. Both the teacher and the student are exposed, limits of knowledge tested. As uncomfortable as this may be, it's the heart of education--the ledge of ignorance for both the student and the teacher is an integral part of the process. It's cheaper. I like cheap. Cheap! Cheap! Cheap! I'm not blowing off mountaintops, damming rivers, or splitting atoms. Most of us doing this gig for any length of time can wow our young charges with flashing lights. We are performers, entertainers, dragging bored children through curricula they see as pointless. So long as our job is to instill a common cultural litany, well, high tech pizazz works just dandy. If you want to teach a child how to think, though, be careful with the new tools. If you are letting an electronic third party make a point in your classroom, and it does a better job than you can, well, draw your own conclusion. You can do better. It might take time, it might require more work, it might even cause you to burst out in tears now and again. You wanted to be a teacher, no? 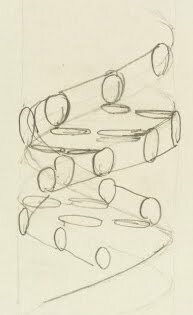 The first drawing above is by Francis Crick, a doodle of his impression of DNA, a concept he shared with his pub brethren. The second is by Darwin. Ironically, neither is likely to be featured in a high school science class. I would say that one on one teaching is marvelous!! Who has that situation in the classroom, however? And if you can't teach a student one on one with a napkin, why you should be flipping burgers at McDonalds. I see your point and embrace it. I do use a lot of technology when warranted because I have 26 chemistry students in my classroom and do it successfully with my Promethean board, laptops, flash presentations and laminate white boards purchased and cut to size from Lowe's. I believe the difference in my classroom is that it is student centered. My students use the tools to illustrate, display and explain what they have learned and come together to present it to each other in a process we call "board meetings". I think if you use technology tools as just a replacement for an overhead projector and still are the sage on the stage in your classroom...yep, you should not be there! Reading your response was a joy! We (public school teaches) do not have the luxury of true 1:1 teaching, and I wholeheartedly agree with you--the technology proves extremely useful in a large, student-centered classroom. I may steal your "boardrooms" idea. Thanks for writing! This is great stuff! Are you on twitter? I want't to follow you.